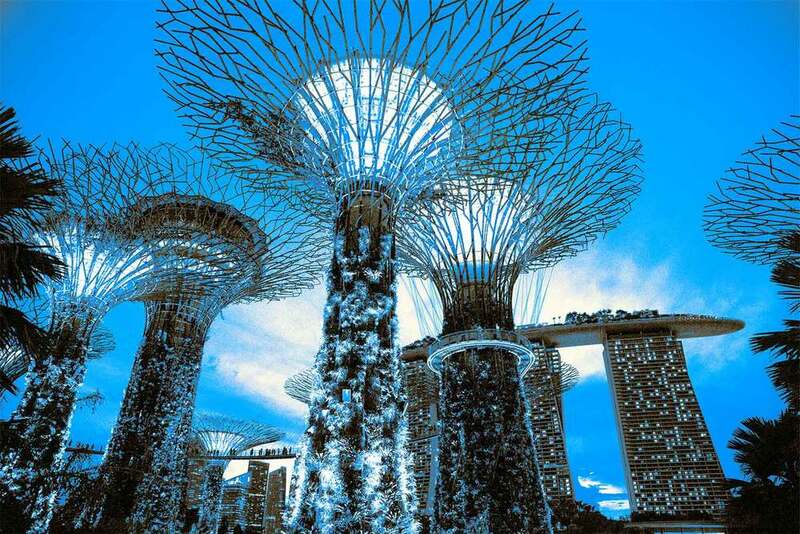 Linda Preece's Photography of Gardens by the Bay reflects Singapore's #1 tourist attraction. For new visitors as well as locals, Gardens by the Bay has that wow factor that makes this one of Singapore's modern marvels of ingenuity. Many sizes and colours available. Gardens by the Bay, Singapore's #1 tourist attraction. For new visitors as well as locals, Gardens by the Bay has that wow factor that makes this one of Singapore's modern marvels of ingenuity. Biodomes, Supertrees and a spectacular view of Marina Bay and the city skyline make this one of the most photographed landmarks in Singapore. My family and I love coming here to stroll around the biodomes with its unique collection of plants and vibrant flowers or to enjoy the seasonal, award-winning flower exhibitions that have made this a favourite tourist stop in SE Asia. After a long day of sightseeing, it is not unusual to find visitors sitting on the grass and gazing up at the sprawling branches of the futuristic Supertrees. The Gardens by the Bay collection captures not only the striking Supertrees, but also the OCBC Skywalk and the famous Marina Bay Sands towers in the background.